Photo by Ginny Kropf: Ric Jones directs a rehearsal of the Middleport Community Choir, a group he first joined as a singer in 2003. At the piano is accompanist Debby Clark, who also directs the Middleport Beltones bell choir. The combined choirs will present their annual Christmas concert at 7 p.m. Friday at Middleport United Methodist Church. MIDDLEPORT – Ric Jones thinks he has the best of both worlds. He gets to work in his chosen field of music publishing. And he gets to do it in his home town. Jones is a 1990 graduate of Medina High School, where his love of music was nourished as a member of the school choruses, band and as drum major of the Mustang Marching Band. He attended Ithaca College, receiving master’s and bachelor’s degrees in music. 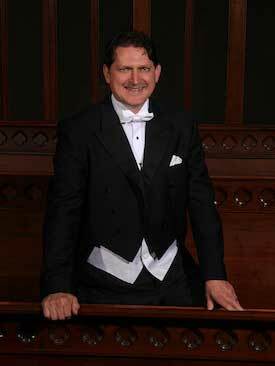 Provided photo: Ric Jones of Medina is director of the Middleport Community Choir, Genesee Chorale and Brighton Symphony Orchestra. Jones married the former Karen D’Amico of Albion/Medina, who teaches high school English at Medina High School. They have three boys, all of whom are musically inclined. The oldest, Nicholas, is already pursuing a music career as a sound technician in New York City. Ryder and Rivers both play trumpet in the band and are in chorus. Jones has written music for more than 200 composers around the world. “The age of the internet has helped further businesses like mine,” he said. He has also written works for Daniel Baldwin, a highly recognized composer in the world of collegiate music, and Gary Gazlay of Florida, who has won numerous awards as a band composer. 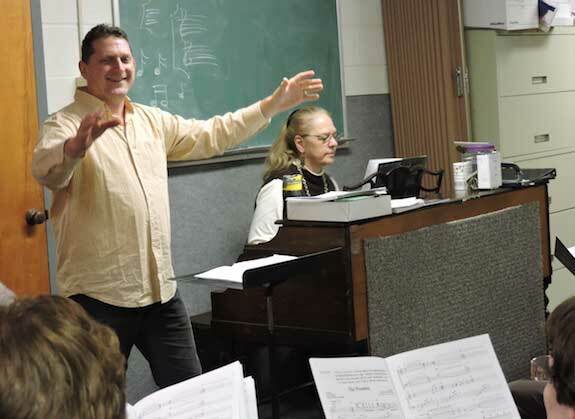 His career also includes being named director of the Genesee Chorale in Batavia and the Brighton Symphony Orchestra. He is also organist at St. Peter’s Lutheran Church in Medina and Trinity Lutheran Church in Wolcottsville. In 2003, another opportunity was opened to Jones when he joined the Middleport Community Choir as a singer. Until that time, the choir focused solely on sacred songs, but Jones would soon change that. They still do sacred music, but have expanded to do Broadway tunes, cantatas and old favorites. They are also developed a relationship with a bell choir from Germany, with whom they exchange visits every several years. Their members come from Medina, Lyndonville, Middleport, Gasport and Akron. Legislator Bill Eick and his wife Pat of Medina are among the choir’s original members. Jones said community choirs are becoming more and more rare, although there are still a few in the Lockport and Buffalo areas. The concert is free. A freewill offering will be accepted. The church is located at Park Avenue and South Vernon Street in Middleport.